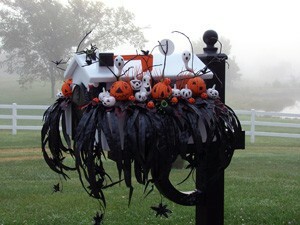 With a mailbox planter for a container to be seen by all who pass by or enter our home, I created this fun Halloween display. I used an artificial spider plant and painted it black, adding last year's harvest gourds and mini-pumpkins. I painted them white and, gave them personalities with a black magic marker. I used foam balls for the larger orange pumpkins. I trimmed a few small branches from my trees and painted them black as well. Then, also turned some white doves black to represent crows. This is awesome! I wish I didn't have an apartment building mailbox because I most certainly would do this decoration otherwise! I don't do "Halloween" but I had to comment on your brilliance for painting the fake plant. I am going to look at the things in my apartment with a new eye. Awesome job! What a cute idea! I wish I had a mailbox to decorate. I decorate my yard and porch every year.